The massacre of 26 children and adults at Sandy Hook Elementary school elicited horror and soul-searching around the world even as it raised more basic questions about why the gunman, 20-year-old Adam Lanza, would have been driven to such a crime and how he chose his victims. First, he killed his mother. 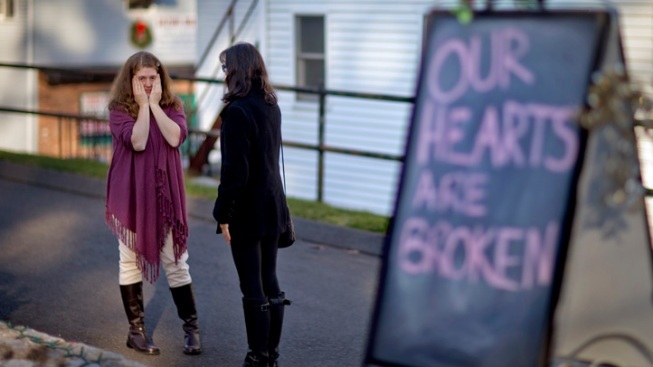 Nancy Lanza's body was found later at their home on Yogananda Street in Newtown — after the carnage at Sandy Hook Elementary School; after a quiet New England town was scarred forever by unthinkable tragedy; after a nation seemingly inured to violence found itself stunned by the slaughter of innocents. Nobody knows why 20-year-old Adam Lanza shot his mother, why he then took her guns to the school and murdered 20 children and six adults. But on Friday he drove his mother's car through this 300-year-old town with its fine old churches and towering trees and arrived at a school full of the season's joy. Somehow, he got past a security door to a place where children should have been safe from harm. Theodore Varga and other fourth-grade teachers were meeting; the glow remained from the previous night's fourth-grade concert. "It was a lovely day," Varga said. "Everybody was joyful and cheerful. We were ending the week on a high note." And then, suddenly and unfathomably, gunshots rang out. "I can't even remember how many," he said. The fourth-graders, the oldest children in the school, were in specialty classes like gym and music. There was no lock on the meeting room door, so the teachers had to think about how to escape, knowing that their students were with other teachers. Someone turned the loudspeaker on, so everyone could hear what was happening in the office. "You could hear the hysteria that was going on," Varga said. "Whoever did that saved a lot of people. Everyone in the school was listening to the terror that was transpiring." Gathered in another room for a 9:30 a.m. meeting were principal Dawn Hochsprung and school therapist Diane Day along with a school psychologist, other staff members and a parent. They were meeting to discuss a second-grader. "We were there for about five minutes chatting, and we heard Pop! Pop!, Pop!" Day told The Wall Street Journal. "I went under the table." But Hochsprung and the psychologist leaped out of their seats and ran out of the room, Day recalled. "They didn't think twice about confronting or seeing what was going on," she said. Hochsprung was killed, and the psychologist was believed to have been killed as well. A custodian ran around, warning people there was a gunman, Varga said. "He said, 'Guys! Get down! Hide!'" Varga said. "So he was actually a hero." Did he survive? The teacher did not know. Police radios crackled with first word of the shooting at 9:36, according to the New York Post. "Sandy Hook School. Caller is indicating she thinks there's someone shooting in the building," a Newtown dispatcher radioed, according to a tape posted on the paper's website. In a first-grade classroom, teacher Kaitlin Roig heard the shots. She immediately barricaded her 15 students into a tiny bathroom, sitting one of them on top of the toilet. She pulled a bookshelf across the door and locked it. She told the kids to be "absolutely quiet." "I said, 'There are bad guys out there now. We need to wait for the good guys,'" she told ABC News. "The kids were being so good," she said. "They asked, 'Can we go see if anyone is out there?' 'I just want Christmas. I don't want to die, I just want to have Christmas.' I said, 'You're going to have Christmas and Hanukkah.'" One student claimed to know karate. "It's OK. I'll lead the way out," the student said. In the gym, crying fourth-graders huddled in a corner. One of them was 10-year-old Philip Makris. "He said he heard a lot of loud noises and then screaming," said his mother, Melissa Makris. "Then the gym teachers immediately gathered the children in a corner and kept them safe." Another girl who was in the gym recalled hearing "like, seven loud booms." "The gym teacher told us to go in a corner, so we all huddled and I kept hearing these booming noises," the girl, who was not identified by name, told NBC News. "We all started — well, we didn't scream; we started crying, so all the gym teachers told us to go into the office where no one could find us." An 8-year-old boy described how a teacher saved him. "I saw some of the bullets going past the hall that I was right next to, and then a teacher pulled me into her classroom," said the boy, who was not identified by CBSNews.com. "The shooting appears to have stopped," the dispatcher radioed at 9:38 a.m., according to the Post. "There is silence at this time. The school is in lockdown." And at 9:46 a.m., an anguished voice from the school: "I've got bodies here. Need ambulances." Carefully, police searched room to room, removing children and staff from harm's way. They found Adam Lanza, dead by his own hand after shooting up two classrooms; no officer fired a gun. Student Brendan Murray told WABC-TV it was chaos in his classroom at first after he heard loud bangs and screaming. A police officer came in and asked, "Is he in here?" and then ran out. "Then our teacher, somebody, yelled, 'Get to a safe place.' Then we went to a closet in the gym and we sat there for a little while, and then the police were, like, knocking on the door and they were, like, 'We're evacuating people, we're evacuating people,' so we ran out." Children, warned to close their eyes so they could not see the product of his labors, were led away from their school. Parents rushed to the scene. Family members walked away from a firehouse that was being used as a staging area, some of them weeping. One man, wearing a T-shirt without a jacket, put his arms around a woman as they walked down the middle of the street, oblivious to everything around them. Gov. Dannel P. Malloy and other public officials came to the firehouse. So did clergymen like Monsignor Robert Weiss of Newtown's St. Rose Roman Catholic Church. He watched as parents came to realize that they would never see their children alive again. "All of them were hoping their child would be found OK. But when they gave out the actual death toll, they realized their child was gone," Weiss said. He recalled the reaction of the brother of one of the victims. "They told a little boy it was his sister who passed on," Weiss said. "The boy's response was, 'I'm not going to have anyone to play with.'"